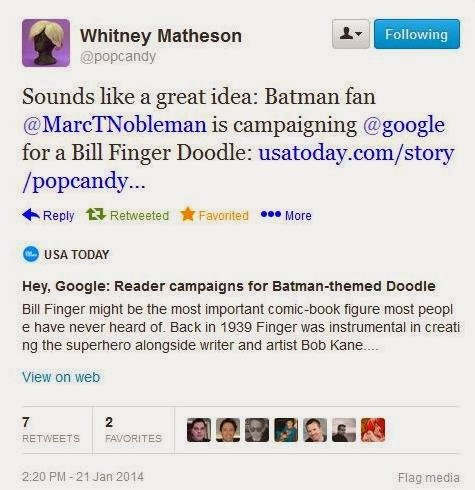 Noblemania: Bill Finger Google doodle: "USA Today"
On 1/21/14, Whitney Matheson of USA Today’s “Pop Candy” kindly threw heavyweight support behind my home-stretch effort to honor Bill Finger’s 100th birthday slash staggering cultural contribution with the 2/8/14 Google doodle. Thank you again, Whitney. So appreciated. I just wanted to say Thank You for doing what you are doing Mr. Nobleman. My name is Andreas H and I'm from Sweden in the northern part of Europe. I've been a fan of Batman all my life, and collector of Batman memorabilia and toys since 1983. I run an account on Instagram titled 'BatmanCollection' that currently has 8.600 followers and I've mentioned the Google Doodle campaign for Bill Finger. I'm a huge fan of Mr. Finger, having known about him since first reading Kane's "Batman & Me" and then reading as much as I could about Batman history. I got your book 'Bill The Boy Wonder' as soon as it came out. I always tell people I meet who want to know more about the origins of Batman to read it. 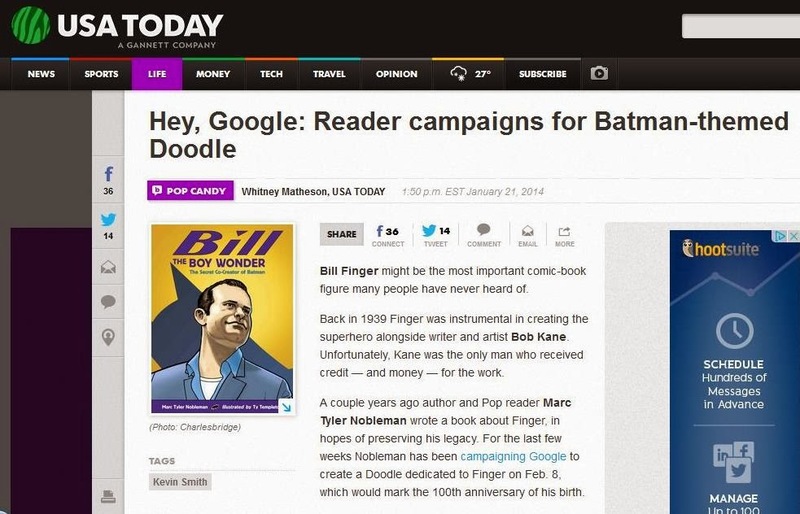 Once again, thank you and I truly hope we will see a Bill Finger Google Doodle on February 8, that happens to be my own (39th) birthday too. That is so lovely to hear, Andreas. Thank you. Happy early birthday and hope it's a day with more than one reason to celebrate!